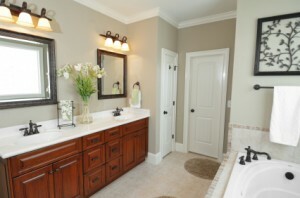 Bathrooms are among the most popular projects for a remodel in the house. As one of the most frequently used rooms in the house, bathrooms see a lot of wear and tear, not to mention the fact that styles and trends for bathrooms are always changing. The odds are that your bathroom is showing its age and could use a facelift. But a bathroom remodel doesn’t just have to be about changing your bathroom’s look, it can improve its functionality as well. Remodeling your bathroom gives you the chance to change and improve its layout. You can increase counter, closet, and cabinet space. You can install additional electrical outlets for appliances like hairdryers, or add towel racks and shower storage. One trend that is currently very popular is giving the bathroom the feeling of a relaxing spa with additions like a music system, rainfall-style shower heads, and in shower seating. Heated floors, heated towel racks, and low-lighting add to the spa dynamic. The use of materials like bamboo and stone are also great at creating this effect. Even if you’re not looking to turn your bathroom into a home spa, you can still put your own personal touch on it with any combination of building materials, paint colors, and bathroom furniture. Are you ready to remodel your bathroom, but unsure of how to finance the project? Read on for the solution from Your Project Loan. This entry was posted on Tuesday, October 1st, 2013	at 2:50 pm	. You can follow any responses to this entry through the RSS 2.0	feed. Both comments and pings are currently closed.